The Polini Evolution CDI is a very technical and advanced product, developed exclusively for competitions on track. The CDI works exclusively with the support of a battery whose consumption is very low, only 0.7 Ah. For example a classic 4.5 Ah battery for 50 cc scooter grants a no-stop use of approximately 6 hours. Energy losses generated by the stator/flywheel have been eliminated by the new system. Even if it does not increase the engine power, the end result is an increase of the hp transmitted to the wheel then giving more acceleration and speed. 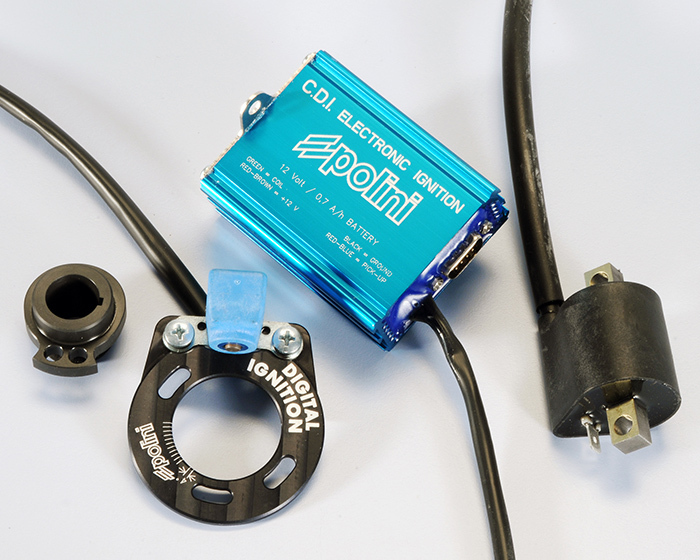 Each CDI Polini contains the connection cable for the custom advance mapping. The program can be downloaded from the CD included in the package. The ignitions for Piaggio/Minarelli engines come with PICK UP support and signal. Universal CDI contains does not include PICK UP support and signal. It can be fit on any engine that has a flywheel with PICK UP. Map of the advance – POLINI EVOLUTION P.R.E. The first Polini Evolution P.R.E. scooter engine developed with advanced Moto GP solutions, and proper for Piaggio ZIP SP, is dedicated to the real riders. Riders who have the race track in their DNA, who do not know any difficulty, who are not satisfied with best but that ask for the maximum power. Riders who feed themselves with real passion; who live the scooter races on the circuits with only one goal: to win. Polini Evolution crankcase for Zip SP with 10” wheels is born from a deep study that has not only involved the crankcase design, but the entire engine group with all its integrated parts. It does not have middle way but only technical choices made to achieve “no limits” performance.